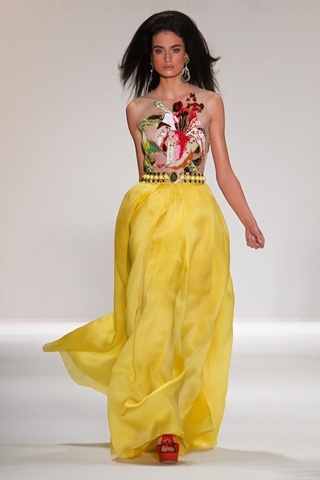 This was my 3rd season seeing Naeem Khan’s collection and he keeps amazing me more and more each time! Not only can you hear applause almost each time a model walks out in a new garment, but there are standing ovations which you don’t see often in other shows. Spring 2011 Collection has a night-out-in-Mexico feeling to it. A lot of bright colors such as fuchsia, yellows, greens, and reds were mixed together for an unexpected color combination. There were also a lot of appliques and deep cuts that highlight the sexiness of a woman. As always the jewelry was by the lovely Ranjana Khan. Chunky multicolored necklaces and long earnings fulfilled the dresses. Whether you’re planning a Spring vacation or want to stand out among the little black dresses for an event, Naeem Khan is THE one.